Marine Electronic Installers and Crestron Electronics have partnered up to offer the full slate of Crestron Automation services. MEI has undergone extensive Crestron training to become a Crestron Authorized Dealer. To meet the high demand of Crestron automation, we have proudly brought on board a Certified Crestron Programmer. Although the Crestron automation system is extremely easy to control with one touch it’s complexities during setup and install must be done by a Crestron master installer. 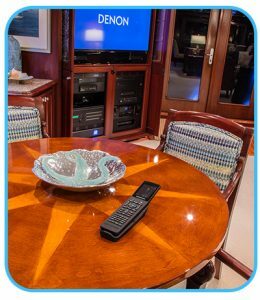 We have done Crestron projects on boats and vessels of all sizes: Cruise Boats, Mega Yachts, Super Yachts, Sportfish, Trawlers, Sailboats, Pleasure Boats. Lately center console boats have been getting bit by the Crestron bug. Crestron electronics and its limitless opportunities to automate and easily control many different functions that already preexist on their boat. The trendy craze to automate and control all Audio / Video related products along with lighting has never been more popular. Larger center console boats with cabins have been utilizing a few more options that the powerful crestron automation system controls. Imagine your AV (audio and video) with limitless capabilities all being controlled by one touch crestron electronics technology. Crestron Electronics GUI (graphic user interface) is compatible with all major brands of Audio Video equipment. Creating a state of the art all encompassing 3D type surrounding for your audio and video. This will allow you to deliver the ultimate digital experience for you and your boat’s guest. 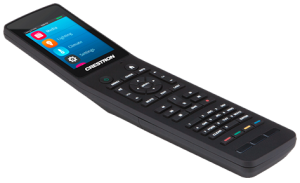 Crestron electronics were the original trailblazers for automation in the marine industry. When you bring Crestron Electronics onboard you can control all areas of your boat by setting up zones. Each stateroom or cabin can have individual setting that allow for one touch controls. 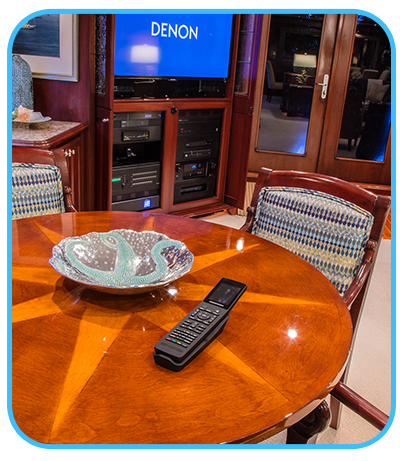 Crestron lighting and shading solutions allow for peak lighting control of your vessel. The shading solutions permit harvesting of natural free light during day hours and setting the mood at night with moon lit scenarios is breathtaking. Envision retrieving your favorite boat drink for said guest… Within mere seconds you can change lighting, turn off the TV and add some mood setting music along with many other options. If you are in isolated tropical locale on the hook don’t worry about lowering or closing your shades but it might be a grand option at a marina or dock to avoid unwanted eyeballs. Call Marine Electronic Installers if you have any questions about motorized window shades or a drapery track system controlled by Crestron shading solutions. 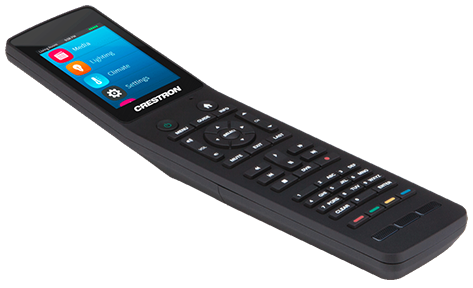 Crestron also gives you the abilities to control all of your functions remotely. Whether somewhere else on your boat or thousands of miles away you can touch a button and activate control common features. Turning on some lights here and there and lowering or opening shades could deter crime from criminals looking for an unoccupied vessel. A smarter more efficient boat is what Crestron’s intelligence can do for you. Whether you need crestron ft lauderdale, crestron miami, crestron palm beach, MEI can assist you with all crestron services: crestron automated lighting system, crestron electronics, crestron programming, crestron system, crestron lighting, crestron automation system, crestron master installer, crestron digital media, crestron tsw 750, crestron tsw 1050, crestron tpmc 8x, crestron pro2, crestron prodigy, tpmc 8x, crestron av3, crestron mlx 3, crestron tpmc 8x ga, crestron tsw 550, tpmc 8x ga, tsw 1050, crestron irp2, crestron cen ups1250. Marine Electronic Installers has carved out quite a niche for the marine sector doing all crestron service. If you need crestron home automation MEI has a sister company ATS that can assist you with a crestron home automation system.